Using recent World Bank data, the Pew Research Center conducted an in-depth analysis of remittances sent from the USA to Latin American countries. Remittances to Mexico peaked at over $30 billion in 2006, but as a result of the Great Recession, have declined by roughly 29% to an estimated $22 billion in 2013. (The analysis is based on constant 2013 US dollars). Figure 1 of Pew Report. Shaded area is period of recession. On the other hand, remittances to all other Latin American countries reached almost $31 billion in 2008, declined slightly but were up to almost $32 billion in 2013 (see graph). Note that the data are for remittances sent through formal channels such as banks and formal money transfer businesses. The average cost of sending these formal remittances is significant, an estimated 7.3% in late 2013. If all informal remittances were included, the remittances to Mexico would be an estimated 50% higher, or over $30 billion. The study focuses particular attention on Mexico because it receives more than 40% of all remittances from the USA to Latin America. Mexico ranks 4th worldwide in total remittances, behind India ($71 billion), China ($60 billion) and the Philippines ($26 billion). These three other countries get remittances from many countries throughout the developed world while 98% of Mexico’s remittances come from the USA. The remaining 2% come mostly from Spain and Canada. No other country in Latin America receives more than 90% of their remittances from the USA. Spain is a bigger source of remittances than the USA for Argentina, Bolivia, Paraguay and Uruguay. This is a bit surprising given the horrible current economic situation in Spain. Many Spaniards are now migrating to Mexico in search of work. The USA is by far the largest source of all worldwide remittances with $123 billion, followed by Saudi Arabia $28 billion and Canada $24 billion. However, on a per capita basis or percentage of GDP basis, Saudi Arabia, Canada and many other countries send significantly more in remittances than the USA. The main reason why remittances to Mexico declined after 2006 is that the Great Recession very seriously hurt the construction industry, a main source of jobs for Mexican immigrants. Related to this, the overall loss of jobs in the USA meant that many immigrants returned to Mexico. In recent years it appears that more have returned to Mexico than have migrated to the USA. Thus the number of Mexican-born residents in the USA is declining very slightly for the first time since the Great Depression in the 1930s. While remittances are extremely important to specific Mexican households, particularly rural households in western Mexico, remittances are not as important to the overall Mexican economy as they are to some other countries. Remittances account for about 2% of the overall Mexican GDP compared to 17% in El Salvador, 16% in Honduras and 10% in both Guatemala and Nicaragua. The average amount of remittances sent by Mexican immigrants is rather low compared to immigrants from other countries. On average immigrants from Mexico over age 18 sent $2,115 in remittances per year, compared to $5,558 for immigrants from Guatemala, $5,231 for Honduras, $3,076 for Dominican Republic and $2,939 for El Salvador. We do not know if immigrants from these other countries had higher paying jobs than those from Mexico. 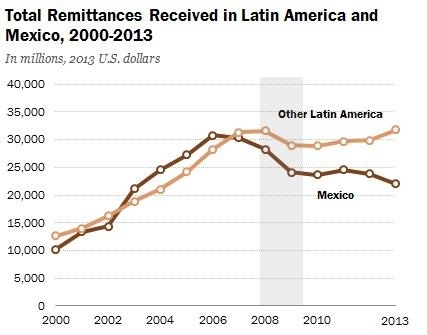 D’Vera Cohn, Ana Gonzalez-Barrera and Danielle Cuddington, “Remittances to Latin America Recover – but Not to Mexico”, Pew Research Center, November 15, 2013. What factors influence the decision about how to send remittances home? International financial flows: how do Mexican migrants send remittances back home?